For the ones that read A Sweetie Dreamland, I hope you like the story so far. I have pretty much the whole story planned, and as I am right now, I can write it to the end without problems. But to give this story its full potential, I may need some help. Hey kids! My name is Sweetie Belle! And I want you to get up and sing along with me and my friends! Report Jesse Coffey · 169 views	· #Sweetie Belle #Sing Along With Sweetie Belle! It is your lucky day, you won your own mansion. You and a guest of your choice can look through the mansion that you just won. I heard of your great adventures with your twin sister Scootaloo, saving Princess Diamond. I decide to give you my mansion because I think that you're better than your sister. Please come by, I can't wait to meet you. I'm sure you'll love the place so much, that you'll never want to leave. It seems that something unexpected happened with our little filly in this new chapter, so go check it out! Expect a really short update tonight, maybe. I'm forgoing editors this time in favour of having some fun in warming back up. Guess what? I finally escaped my inspiration dry spell and I'm proud to say the authoring of chapter 4 has begun! It should be released sometime tomorrow. Look forward to it! I already have Scootaloos bio on the right of my user page so let's just do her friends. So, I have the first few pages of a new story. It's barely related to the story I said I was working on a few months ago, except that it's a story about magical talking horses. Hope you're ready for another trip into Sweetie Belle's head. The League of Sweetie Belles has a simple concept: take a bunch of alternate versions of Sweetie Belle, throw them on a ship, and then have them explore various pony-related universes one chapter at a time. These worlds will, naturally, come mostly from various fanfics on this site. So I accidentally stumbled across Don't Mine At Night Pony Parody, by Janamatian Studios. Two minutes in, I was a fan of Button Belle. I don't know how other shippers resist these two! I already have two stories planned out, one for shipping,one for superheroes. This is the longest chapter I've done in this story, so I hope you all enjoy the read! Go check it out guys! Sweetie will definitely have more fun in this chapter! 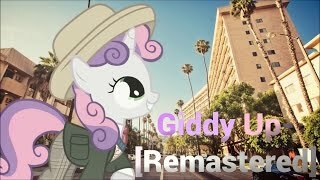 If you're looking for a quick dose of cuteness during this mid season hiatus, check out this cute little video featuring Sweetie Belle. Just make sure you've got some insulin ready.